Title: QUESTIONS ON BRITISH HISTORY and the British Constitution with Answers. 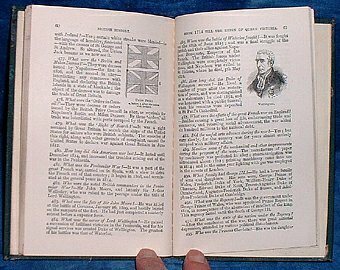 Description: London, William & Robert Chambers 1881 Text illustrations. . Small octavo green blindstamped cloth (tips rubbed/ bit marked) Tititlepage +Notice & contents +84pp including index. Small number to corner of flyleaf and some neat pencil check marks but otherwise neat, tight and clean.